Marvel’s Agents of SHIELD brings Robbie’s conflict with Eli to a head as Aida’s true nature becomes much clearer. Robbie’s quest for vengeance has been the driving force of the opening arc of this season and it has been handled really well. Gabriel Luna has been great as Robbie Reyes and story surrounding him has never been short of compelling. 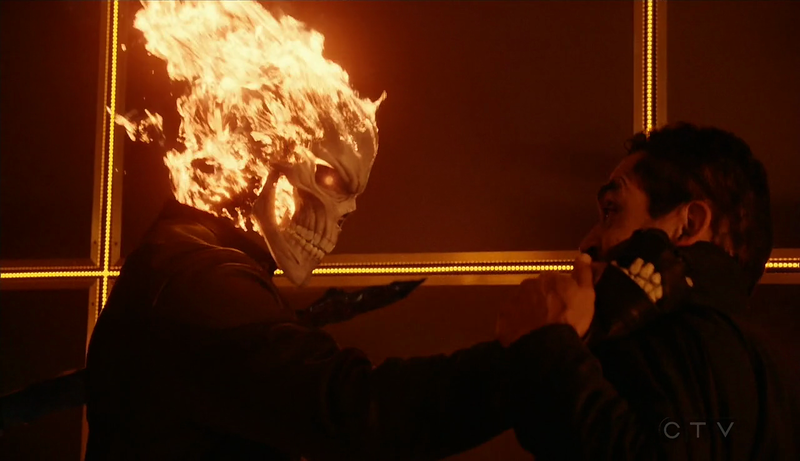 It also helps that the Ghost Rider effects are excellent to look at. Eli has been a lot less interesting because the truth behind his involvement in Gabe’s injury and Robbie’s transformation in the first place didn’t come out until fairly recently. He didn’t even gain abilities until last week so his time as a villain has been really short lived. This episode doesn’t quite build him as the significant threat that everyone says he is. Sure he has abilities that seem magical but his motivations and overall plan aren’t all that clear. This almost doesn’t matter as the personal conflict between Eli and Robbie is far more interesting. Most of their conflict involves a conversation and it’s a really good one. I found it interesting that Eli assures Robbie that he didn’t plan for anyone to be hurt as he pursued his goals but doesn’t ever apologise for what his actions caused. This is important to Robbie as he clearly needs Eli to accept responsibility for what he did to Gabe otherwise the vengeance will mean far less. Coulson points out that Eli is blinded by hubris and that’s actually the best way to describe the way he’s acting. Robbie does get his revenge but I get the feeling that it feels somewhat empty to him since there was never an admission of wrongdoing or any sense that Eli actually cares about what he has done to his family. Robbie sacrificing himself to make sure that Eli was out of the way made dramatic sense and I don’t expect Robbie to be off the board for too long but what he returns with will hopefully be interesting. After all he did promise to settle the Ghost Rider’s score in return for settling his own so we must be due to see that play out over the coming episodes. Another thing that we’re supposed to take from this is that he is consumed by his new power but actually doesn’t really understand it. In his mind he creates matter from thin air but everyone else is convinced that this is impossible according to all physical laws. Matter and energy cannot be created or destroyed, only changed so Eli is stealing energy and matter from somewhere else without considering the consequences. This is a compelling idea to play with. It takes a slightly different angle on the magic vs science debate started in Doctor Strange and addresses it in a more confined way since Fitz only has a basic understanding of the concept of multiple realities. He’s along the right lines but lacks the pivotal information that will help him truly understand this. For now he knows that what Eli conjures must be coming from somewhere but can’t figure out where that is or how he does it. It’s all well and good to speculate on this but in the context of the episode it doesn’t actually go anywhere. Logically I was expecting Eli’s lack of understanding to be part of his undoing and it would have been an effective pay-off if something had happened that allowed Fitz to understand enough to help facilitate that. As it sits it remains a background discussion that could have built to something but didn’t. Daisy, Mack, Coulson and Elena were tied into this story and all had significant parts to play. For Daisy this episode was about deciding where she fits. She returns to the fold officially in this episode after the public sees her and Mace is forced to make a decision on S.H.I.E.L.D. as an organisation’s public approach when it comes to Quake. He decides to do the right thing by her and say that she was on an undercover mission that has now ended. Having her out on her own for so long has been really good for her character as it has developed her along unexpected lines. Now that she’s back the dynamic she has with the others should be altered in some way and bring a much needed freshness to the group. She has been away for long enough so now it’s time to rejoin the fold. The hints of her powers growing were a really nice touch as well and I loved seeing her running outside to release pent up energy by throwing herself into the air. Her lack of experience with Mace is an interesting idea to play around with as she only has the anecdotal information she receives from Fitz and Simmons who clearly don’t like him but her own perception will be largely built on how she has been treated by him which proves to be somewhat positive at this point. Mace is still a bit of a question mark. He does seem like a good guy overall but some of his actions are very suspicious and I do like that the show does just enough to keep him from becoming likeable. Even though he joined the team in the action sequences this week he still doesn’t feel part of it. Seeing him suited up and in action was really cool as well. Elena had plenty to do in this episode which makes for a refreshing change. I’m glad that the “will they/won’t they?” question that has been dancing around between her and Mack for a while now has been answered with a resounding “they will” as I couldn’t deal with that going on much longer. Natalia Cordova-Buckley and Henry Simmons have such great chemistry so seeing that actually develop into a relationship might provide some good material. She also had the most memorable moments when it came to the action through creative visualisation of her ability. The slow motion scene as she did recon and started the fire was really well done. 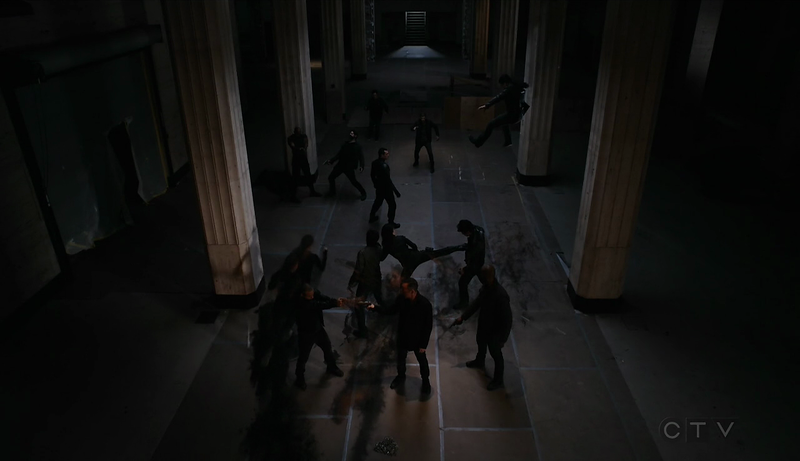 I also loved the lower budget recreation of the infamous Quicksilver scene from X-Men: Days of Future Past. It was really cleverly done and made me chuckle into the bargain. 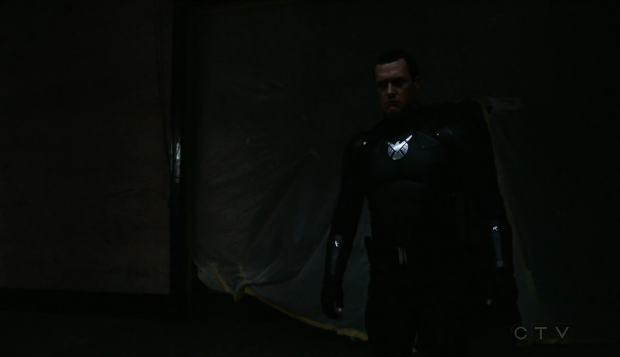 Coulson’s contribution other than taking on Eli in his own way was to be the point of trust for the team. He agrees with Mace for once which means that he is able to bring the team around to his plan. They aren’t loyal to Mace but they are loyal to Coulson and that’s an important difference as he is able to get them to do things out of loyalty that Mace never could. The development of Aida was great as well. It’s pretty clear that she has gained sentience and is starting to dislike humanity which can only be bad news. Ultron is directly referenced which makes sense since he is a really powerful cautionary tale against Artificial Intelligence. Aida seems fairly normal until the end of the episode when it is revealed that she has created a Life Model Decoy of May which isn’t all that interesting in itself as it depends what comes from it from a character and story perspective. The point that May was replaced will be important information as it could actually explain her behaving out of character over the past few episodes. It seems more likely that the swap happened sometime between last week and this week because it seems to me that it has to come after Aida read the book and there hasn’t been a lot of time since then. My thinking is that Aida’s decision to act against humanity came after she was shot in this episode. A lot of attention was drawn to the fact that she was programmed to mimic humans as much as possible which includes simulated pain and fake blood. She seems visibly alarmed by the fact that pain was something Dr. Radcliffe programmed her to feel and it’s a very powerful reason for her to feel betrayed by the one that created her. This could be really interesting if played right as it could offer commentary on the arrogance of humanity while exploring what it means to be newly sentient. I think this will be more complex than your average villain story and it could go into territory that Avengers: Age of Ultron just didn’t have time to cover. One thing I can’t work out is why Aida has captured May but I suppose we’ll find out. Another thing this episode provided was a chance for the characters to enjoy some downtime and interact in a social setting. It has been a while since we’ve had this and it’s definitely long overdue. There was almost nothing to it but that’s sort of the point as these characters get so little time to unwind. It helps bring their personalities out in really natural ways and there should definitely be more of this. 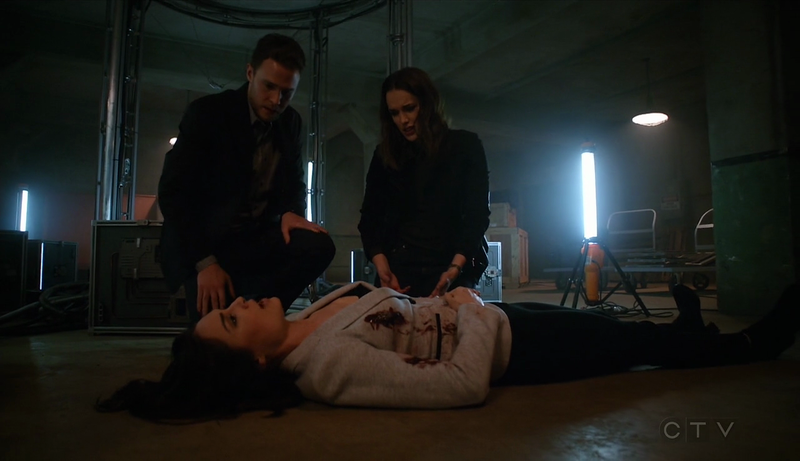 That’s it for Marvel’s Agents of SHIELD until January so join me then for more reviews. Another solid episode that brings a close to Robbie’s revenge arc while developing Aida to be the next main antagonist. Robbie’s conversation with Eli was really well done but it’s a shame that there wasn’t enough time to establish Eli as a villain before this point. The whole debate on science vs. magic and how matter/energy can’t be created or destroyed was interesting but didn’t really go anywhere. Other characters were used well such as Daisy having a reason to rejoin the team and Elena getting the best action beats. Mack and Elena finally admitting their feelings is a nice touch too. The development of Aida specifically after feeling pain was great. She has every reason to turn against her creator after questioning why she would be designed in such a way. There’s a lot of scope for her to become a complex antagonist who can comment on the human condition.